Musical paeans rarely damn with faint praise. And on September 30, Coro Ciconia, directed by Asher Davison, will open the 2018–19 SFEMS-CJC series with a praiseworthy program of works by Machaut, Ciconia, and others. Performers in this a cappella vocal program will be Cheryl Koehler, Dorothy Manly, Jean McAneny, Ralph Prince, Scott Robinson, and Helen Wolfe-Visnick. Coro Ciconia (founded ca. 1995) is a 6- to 12-member group in the East Bay specializing in early- to high-medieval vocal music. Directed and administered for fourteen years by flutist Peter Fisher, who succeeded the inimitable Shira Kammen, the ensemble enjoys immersing experienced singers and inquisitive audience alike in this rewarding and foundational repertoire. Coro Ciconia’s program will be an exploration of (mostly) secular works—his last four motets and three chansons from Rémède de Fortune—of the great French poet Guillaume de Machaut (ca. 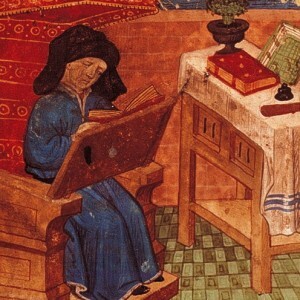 1300–1377), plus four great works of their namesake Johannes Ciconia, and two one-hit wonders: the I senti of Jacopo, and Andrieu’s déploration of Machaut. Director since summer 2014, Asher Davison is a copyeditor, science educator, and long-time clarinetist who strives to deepen the group’s understanding and conveyance of both the history of both Western tonality and the ceaseless dialectic between music and text. Emphasizing rhythmic coordination and diction and drawing also upon his experience as an instrumental chamber music coach, Asher works to broaden the group’s flexibility and responsiveness as it develops into a minimally conducted, chamber approach.